An almost cult like status has been fostered for Aleksey Mozgovoy the military commander in the area of Luhansk oblast occupied by the self-styled ‘Luhansk Peoples Republic’. This mythology of Mozgovoy as a new Che Guevara has been prominent amongst the Stalinist organisations. Mozgovoy is well known for his Russian chauvinist views, his ‘peoples courts’, his misogynist attitudes – reported in English also by Vice News. Following the assassination of Mozgovoy the Communist Party of Britain’s Morning Star hailed him as “anti-fascist commander” in The Man Who Led the Ghost Brigade – failing to mention anywhere a few days earlier Amnesty International published a damming report on serious abuses committed by the Prizrak [Ghost] Battalion against Ukrainian prisoners. Published below is an article by Ukrainian activist Aleksandr Volodarskiy from the Ukrainian left site Nihilist. A few hours after Mozgovoy’s death I promised to write a column under a title ‘Mozgovoy is no Che Guevara but a never-to-be Kadyrov’. But I didn’t write it in the end. Because I doubted the premise. One cannot juxtapose Che Guevara and Kadyrov. Well, indeed, if we are to consider the real historical Che Guevara, then the only two things he and Mozgovoy have in common is that they both carried arms and they both disliked USA. But who cares for real historical figures? Che Guevara is first and foremost a widely advertised commercial image that has little to do with the real Commandante. And we all are obliged to love that image; except for raging anti-communists who go rabid at the sight of anything red. On 18th February 2014 when the first clashes in Kyiv began, I met a man near the already smoking Party of Regions office. The man was holding a Cuban flag with Che’s portrait on it in his hand. Those symbols suddenly stood out in the general blue-and-yellow and occasionally red-and-black background so I asked the ‘Cuban’ why he chose them. The answer was simple yet ingenious: ‘I chose this flag because I protest. Because I am a patriot of Ukraine!’ And then some year later in one of Kyiv’s hostels the Cuban flag and Che’s portrait was peacefully side by side with symbols of the Right Sector. The latter too is thoughtlessly used by people who have no idea of the real ideology of that organisation. That hostel by the way housed displaced people from Donbas. The first lines about Mozgovoy as a new Che were written by Boris Kagarlitsky. Boris Yuliyevitch is rather clever especially if one is to consider that for many years now for the left he managed to be the mouthpiece of Kremlin and that he still was not caught red-handed, neither were there attempts to beat him up. Thence we shall certainly lend him an ear. Leeching off the trust of the left, including the Western, Kagarlitsky knows perfectly well their psychological makeup as well as knowing prefectly what makes a good ‘Che’. Mozgovoy was a unique phenomenon among field commanders of “Novorossiya”. That is why he and not Batman, for example, was appointed as a Che. It is unclear to which extent it was his own or his image-makers’ achievement. One thing is certain and that is that the latter were professionals. Collectively created image of a rebel did not only appeal to all supporters of separatism without exception but also even to some of its opponents. Mozgovoy was in charge of all sorts of people. For example, there was a notorious Nazi Milchakov in the ‘Prizrak’ who was an internet dog killer celebrity in his youth and now practices his sadistic inclinations by finishing off Ukrainian soldiers. There were a lot of those who identified as ‘communists’ in the ‘Prizrak’, including ex-members of Borotba. There were Nazis, and monarchists, and ‘left’ supporters of Novorossiya project and all considered Mozgovoy as their leader and valued his ‘people-ness’. There were people sympathetic with the late field commander on Ukraine’s territory too. His contacts with Tetyana Montyan too were widely discussed. Mozgovoy made proclamations of his intentions to hold negotiations with the Ukrainian military. His was often viewed as a compromise leader of ‘rebels’ in case of further reconciliation and re-integration of ‘people’s republics’ [into Ukraine – trans.] occurs. He was not like Igor Girkin who is too obviously a monarchist and Orthodox Christian fundamentalist fixated on his own prejudices. Neither was he like the obvious thugs Givi and Motorolla who boasted in public about humiliating captives and openly engaged in looting. Mozgovoy was a commander ‘with a human face’ [Reference to Dubcek’s ‘socialism with a human face’- trans]. Much of what he said in his interviews and video addresses could easily fit a parliamentary address given by any MP from any faction. Let us take a brief look at his rhetoric. Hatred of oligarchs – the cornerstone of Mozgovoy’s reputation as someone almost leftist. Everybody talks about opposing oligarchs these days. All of them – Leshchenko and Nayem and Yarosh, Kyiv Trotskyists who are building a new toy party and president Poroshenko. No-one likes oligarchs and thus telling them off is a winning game. Criticism of a fratricidal war. It is quite bizarre to hear anti-war propaganda from someone who made all possible to incite that war since early spring of 2014. Mozgovoy however managed to do it in rather convincingly for those less in the know. Brethren are fighting brethren and everyone hears in that phrase what they wish to hear i.e. Ukrainians are fighting Ukrainians, Russians are fighting Russians, Slavs are fighting Slavs. And of course they are forced to do so by some evil external forces. One more important point – conspiracy theories. There are some secret forces that ignite the war and benefit from it. Considering that Mozgovoy is no recluse spreading peaceful propaganda but a field commander who recently marched on Debaltseve the forces in question in his view are on the other side of the frontline. But of course they are not ‘the Ukrainian brethren’ but rather something immeasurably terrifying and dark. The right will instantly see here the good old Jewish masonry conspiracy but for the ‘communists’ it will be the western imperialists. The latter differs little in form or structure from the Jewish masonry conspiracy at the end of the day. Social agenda. All and always talk about the social agenda. Poroshenko for example depending on the mood portrays himself as anything, even an almost social-democrat while at the same time talking of the necessity of radical market reform. But then again, when was the last time our politicians followed any logic? BYuT [Yulia Tymoshenko Bloc ] too talks about it, sold out KPU does too and so does the Right Sector and Svoboda. Ukraine’s mass electorate is poor or balancing on the verge of poverty and that means that any force willing to win must make populist promises even if those go against the grain of its politics. Power to the people. Universal meaningless phrase that can be easily interpreted as the left and right alike. In ‘power to the people’ one can see ‘direct democracy’ of anarchism or ‘organic democracy’ that Mussolini was implementing as part of the fascist project. ‘Power to the people’ existed in Gaddafi’s Libya according to the Green Book apologists. Maidan too was called an example of the ‘power to the people’. Terms such as ‘people’ are usually missing from serious political discussion but it fits slogans perfectly. Mozgovoy spoke exactly in slogans and he did it with professional touch. He could have made a great ‘Donbas Kadyrov’ if the Kyiv government managed to find a common language with him. Home-grown leader of ‘LNR-DNR’ and not some oligarch or imposed by the ‘junta’ ‘Moskal’. 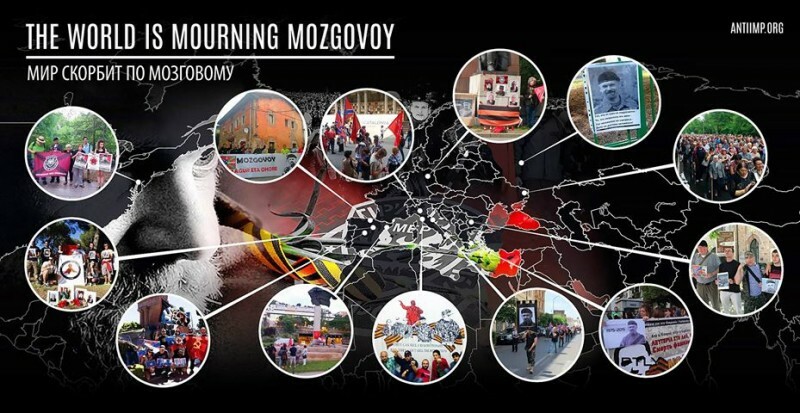 Mozgovoy could have harshly and war-like brand the sly US and Russian instigators of the war. Russia too could have been pronounced a US marionette – the people’s leader knows not impossibilities. He could do the dirty job of purging the unfortunate territories for Kyiv too. Mozgovoy could have become part of political Beaumont turning from the instigator of war into the man who brought peace to Donbas. It is important to understand that there could be no relationship of vassal fidelity between Poroshenko and Mozgovoy like there is between Putin and Kadyrov. Most likely he would have ended up in the ‘constructive opposition’ to the regime while serving as a shield for the old Party of Regions folk who are not so interested in separatism but in a Ukrainian Donbas although on their terms. His membership could make a great ‘Party of Peace and Reconciliation’ with some serious electoral prospects. Its list could have been topped by some Ukrainian patriot from the west of Ukraine who ‘has heard Donbas’, some politician from Kyiv with a trending Facebook account, and of course Mozgovoy himself who would have embodied the autonomy of Donbas on the one hand and the fact that Donbas remains a part of Ukraine on the other. Many of the people who seem lost for Ukrainian politics today could be among the members of this hypothetical party; those who are forced to play the game of forming ‘political emigrant committees’ in Russia and Crimea. Mozgovoy could have become a leader of an ‘independent Novorossiya’ with the same ease. He did not look like a thug but he was no smarty pants [intelligentishka] either. Being neither Russian, nor Ukrainian he could be ‘their own’ for either. He was orthodox Christian and it was not a charade. He liked Lenin and he did not like oligarchs although he was in no rush to lead people into the last and decisive battle. That allowed the hardnosed people who financed that circus to not worry. Power did not go to his head, he did not marry schoolgirls, neither did he gift them trophy cars. This sort of a leader could really have been loved if local population were to be brainwashed accordingly – they loved worse before. Mozgovoy potentially was handy for Russia and Ukraine alike. At the same time he presented a danger for both as neither side wanted such convenient political resource to be used by their opponent. But most danger Mozgovoy presented to the acting ‘LNR’ authorities as regardless of who he would serve at the end those authorities would get in the way in his role as a the saviour of Donbas, whatever one would mean by ‘saving’. But now Mozgovoy has died. According to the official version of events he was killed by Ukrainian spies. The version suits Ukraine who can now say that they are die-hards and can eradicate enemy commanders. It suits Russia with LNR well too as it removes the necessity to ask them a whole array of uncomfortable questions. And now Mozgovoy is doomed to become an object of a cult. Maybe the cult won’t even last a decade as most now have flash consciousness and ‘heroes’ appear and disappear in course of months. However Russian propaganda is interested in making a new Che out of him to attract those who still hesitate in the west and not only lefties. Mozgovoy has it all to become a legend: a beard, a few phrases against oligarchs. The latter in combination with the beard looks very lefty, even Yarosh could appear lefty with that. 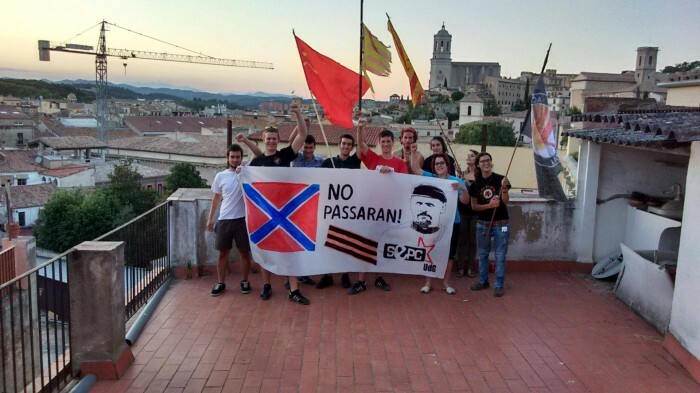 In addition there is participation in the ‘anti-fascist forum’ which was held soon before his death. One impressionable Argentine lady wrote about the cadaver ‘if he was not a communist, he really looked like a real communist’. This is an exemplary comment. As for people who perceive politics via slogans and images it does not matter at all what those are in reality. What matters is what they look like. If Ukrainian patriots are seriously ready to see Ukrainian nationalist symbols and UPA flags in blue-and-yellow and red-and-black flags in Chile, then some foreign Stalinist will see a reborn Che in any bearded man who curses oligarchs in an incomprehensible language. The main thing is that he looks ‘like a communist’ and the legend will follow. 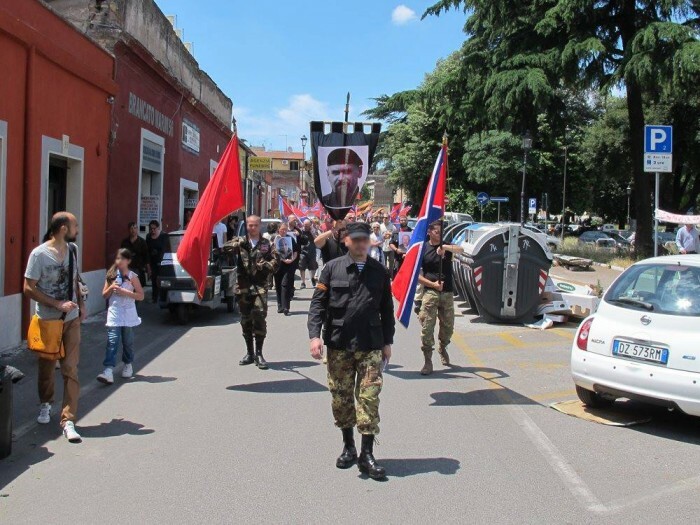 Below is an exemplary photograph from an Italian demo commemorating Mozgovoy. 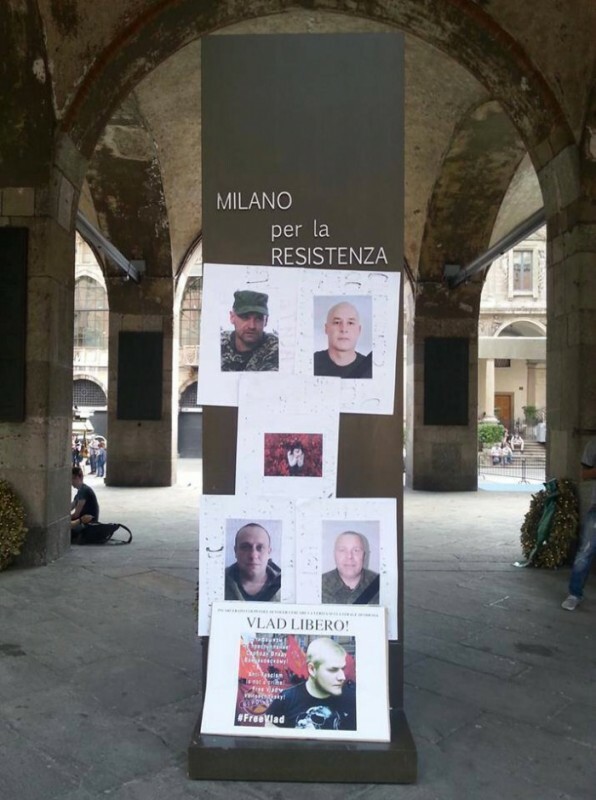 Its participants commemorate the ‘left’ commander and at the same time demand that Vlad Voytsekhovskiy of Borotba is allegedly ‘falsely accused’ of separatism is freed from the claws of the ‘junta’. It would all be great if only the ‘falsely accused’ of Borotba was not freed last winter already as part of an exchange [of captives with LNR – trans] and went to LNR to fight in Mozgovoy’s brigade. The picture speaks volumes. For example it tells us that foreign fans of ‘Novorossiya’ do not care in the slightest about what is happening in reality even with those who they supposedly support. They care about feeding their illusions, about imagining that they are back in the times of the Second World War and are supporting the struggle against the ‘absolute evil’. This war has started mainly thanks to the white guard historical reenactor Strelkov. Communist reenactors are now trying to break even. Not even like the reenactors who as a rule try to re-enact the past with accuracy but as reenactors of fantasy role-play also knows in laymen’s terms as Tolkinists. A stick held in one’s hand and called a sword usually suffices. Mozgovoy is a perfect Che for that kind of Tolkienists of the left. Volodarskiy from the Ukrainian left site Nihilist.